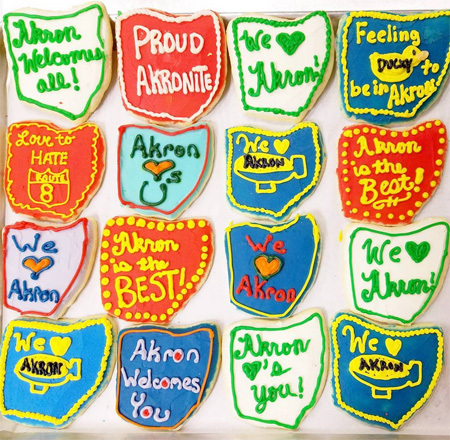 In February, downtown Akron employees from Akron-Children’s Hospital, Summit County Courthouse, and other local businesses were asked to complete an anonymous survey regarding their lunch break habits and favorite downtown locations. Employees were also asked to rate food & drink options based on affordability, quality, and other factors. The results? A vast majority of employees gave local eateries very positive reviews when questioned about quality and convenience. Most employees who completed the survey were full-time commuters who received at least 30 minutes for lunch - 20% of employees also responded that they preferred to leave their place of employment to eat lunch. Cilantro, Diamond Deli, and The Lockview were the three most frequently visited establishments by employees. Cilantro and The Lockview tied for the favorite lunch location overall. Employees were also given the opportunity to write a short response at the end of the survey, intended to gauge what improvements Akronites would like to see. The overwhelming response was: more locations! The majority of surveyed employees stated that they wanted to see more locations and more variety come to downtown Akron. Among the new locations employees expressed the desire to visit were Sweet Mary’s Bakery and Chill Ice Cream. Sweet Mary’s Bakery is located at 76 E. Mill St. and offers delicious baked goods, breakfast and lunch menus, as well as locally roasted coffee and fair trade tea. Chill Ice Cream, located at 21 Maiden Lane, was started by three Northeast Ohio natives with a passion for gourmet ice cream made with fresh ingredients from Ohio farms. Employees should take advantage of upcoming beautiful spring weather to go for a stroll and explore downtown’s cuisine scene! Locations, directions, social media links and more can be found at www.downtownakron.com/explore.